I became a vegetarian in 1990 as a Sophomore at U.C Berkeley. I was away from my conformist hometown and able to make decisions for myself for possibly the first time in my life. I quite easily decided that I no longer wanted to kill animals to fuel my body. It was as simple as that. It was an easy decision and I am committed to my vegetarianism from all parts of my being. For the past 20+ years, I've been collecting vegetarian cookbooks. It started out of necessity. I became a vegetarian without really understanding what I would eat. How would I nourish myself? What would I bring for potlucks? My image of a plate of food revolved primarily around an animal protein with some vegetables on the side. The internet didn't yet exist as prevalently as it does now, so I couldn't google search "vegetarian recipes" and "pin" them, so I began buying cookbooks.
. Breitenbush is a wonderful place with meditation spaces, yoga, hot springs, hiking in the mountains, a beautiful river, and all vegetarian food. The food was delicious. I remember eating a loaf with gravy; I had never tasted something so delicious. For breakfasts, there was granola, soymilk, tofu scrambles, and whole wheat waffles. My mind expanded. I bought the hot springs' cookbook before we left. 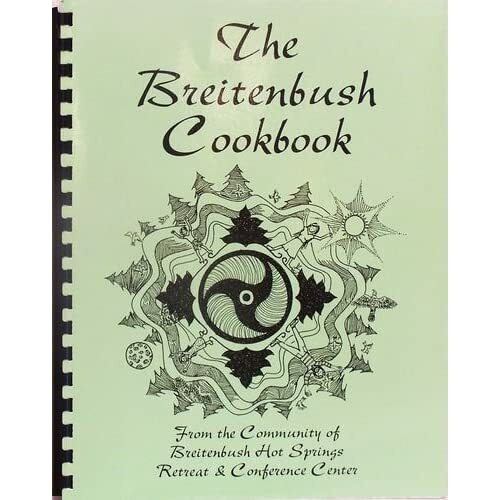 When I was in library school, I lent my Breitenbush cookbook to one of my classmates who claims that she lost it. I plan to replace it, but I haven't gotten around to it yet. Now, I have approximately 50 vegetarian cookbooks. I also have a binder that I've created of favorite recipes and recipes that have been passed down in my family, and recipes that I use for Jewish holidays. If Scott and I are in someone else's house, and they have built in shelves in the kitchen, Scott often comments on how I would love that feature for my cookbook collection. Until I get my dream kitchen, my cookbooks sit on these Ikea shelves which I bought and asked my neighbor to install. One boyfriend back then was a passionate meat eater. We had horrible fights after we returned home from an event where food was shared by everyone, and there was nothing for me to eat. Despite my protests, I hosted a sushi making party for his birthday complete with many kinds of fish. He was not at all respectful of my compassionate eating choices. He was also the boyfriend who laughed at the fact that I was becoming a librarian - he didn't see it as a good career choice. I wish I had seen that he was not the right one for me and broken up with him before he broke my heart. When I dated my husband, it was the first time I had dated a vegetarian. With him, I got to explore the world of vegetarian restaurants. We could order anything off the menu. It felt like I was back at Breitenbush with a bounty of vegetarian options without the need to feel apologetic. I married that vegetarian boyfriend. I still don't cook much, but I love my cookbook collection. For special events, I pull down some of my cookbooks. Recently, for Passover, I took a day and a half off from work to cook. Here are 2 of the dishes I created - a yellow squash gratin, and a quinoa pancake thing. When I focus my mind and cook, it all turns out pretty good, I think!